Muslim Association of Taranaki | Islamic Centre Tender Successful! Alhumdulillah our tender was successful and we have purchased the property at 185 Smart Rd as our first Islamic Centre here in New Plymouth. JazakAllah to all those who have contributed and made dua for its success, please continue to do so. Alhumdulillah we have raised over $200 000 and need your support in raising a further $250 000 to settle the remaining amount with the vendors; obtain necessary consents; build a carpark on site and undertake neccessary building repairs/improvements prior to moving in. Settlement date is 31 July 2015. InshaAllah we will update you with any progress. 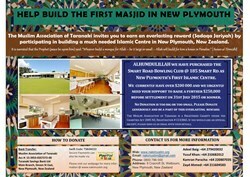 Please share the attached poster (New Plymouth Islamic Centre Appeal.pdf) to widen the fundraising campaign. We ask you all to spread and share it through all your social media and other connections so that we can raise the required amount by settlement inshaAllah. JazakAllah Khair to brothers and sisters who have already deposited their pledges in the mosque account and a reminder to those who are yet to do so, to do it as soon as possible. A reminder that it is both our responsibility and an amazing opportunity to cash in on this big chance to earn Jannah for ourselves and our Parents. If you can assist in anyway or have any further questions or queries, please contact one of the members of the committee.